Sheltering and Shivering – Run. Ride. Roam. What’s that I hear out the window? Is it? Open the curtains and take a glance at…the rain! Oh well, we did have sunshine yesterday, so here we go again with the sun being swiftly followed by rain. 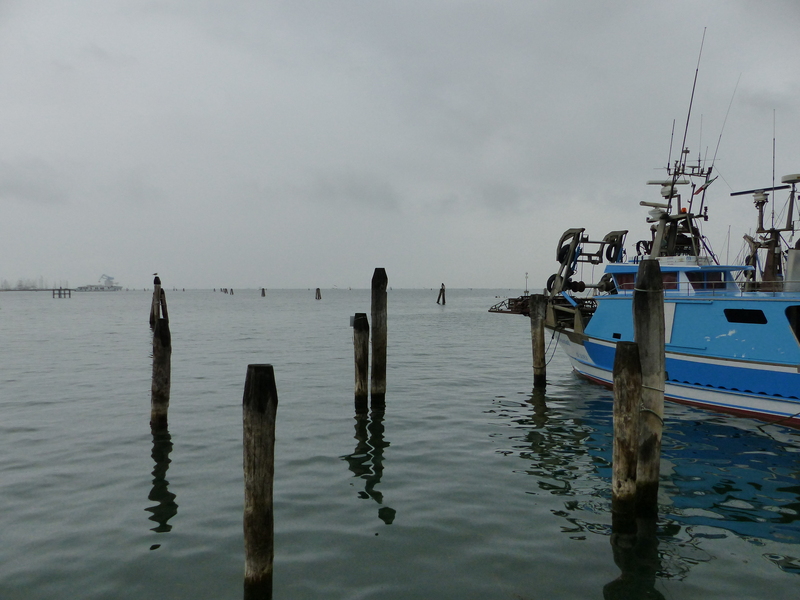 We packed up, zipped into our slicks, hopped on the bikes and pedalled out into the soggy streets of Chioggia. It was wet, but not too cold, so all in all, not too bad. After leaving the city centre, we were back on a busy highway, which immediately made the already slightly tricky conditions, just a little bit less pleasant. Following the GPS route, we turned off the main road and I heard Steve exclaim, “You’ve got to be joking!” We had turned off the road, onto yet another dirt track. We thought about just bumping along it, but decided with the rain coming down, we were bound to hit slippery, muddy, puddly or boggy bits, which would hinder our progress, so we decided against it. When we had ridden along the main road, we’d come to a line of traffic and we weren’t too sure if it was just commuter congestion or an accident. We decided to go back to the main road and ride along the shoulder, while the traffic wasn’t moving, to make some progress without it being too hazardous. After a few hundred metres we could see flashing lights up ahead, so it was clear there was some sort of accident. I felt really uncomfortable now. I didn’t want to ride past a car crash and I didn’t want to be seen to be taking advantage of the situation by riding past the line of traffic. We were close to the accident now, so in the end we kept going, with eyes firmly front. Neither of us looked either side, just straight ahead and the police didn’t seem to worry that we were there and we did see some other cyclists and a motorbike go through too. All we could see, from peripheral vision, was a car in the ditch on the side of the road, looking very beaten up and a truck off the road in a ditch on the other side of the road and another car on the tow truck, looking beaten up. I just sped up and got past the scene as quickly as I could. We kept going and the line of waiting traffic kept on going too. The riding was getting lower and lower on the fun-o-meter so we decided to find somewhere to shelter and see if the rain would ease off a bit. We rode into Sant Anna looking for a spot to sit, without success, so in the end we went back to a bar beside the highway, took up position at one of the undercover tables outside and had a cup of tea. Getting warm while riding, then stopping and cooling down, combined with being wet from the rain, created an inevitable shiverfest, so I sat and shook and put on a fleece, but still shivered, while hugging my tiny little tea cup, to at least warm my hands a bit. All the while, the traffic in front of us on the highway, hadn’t moved. 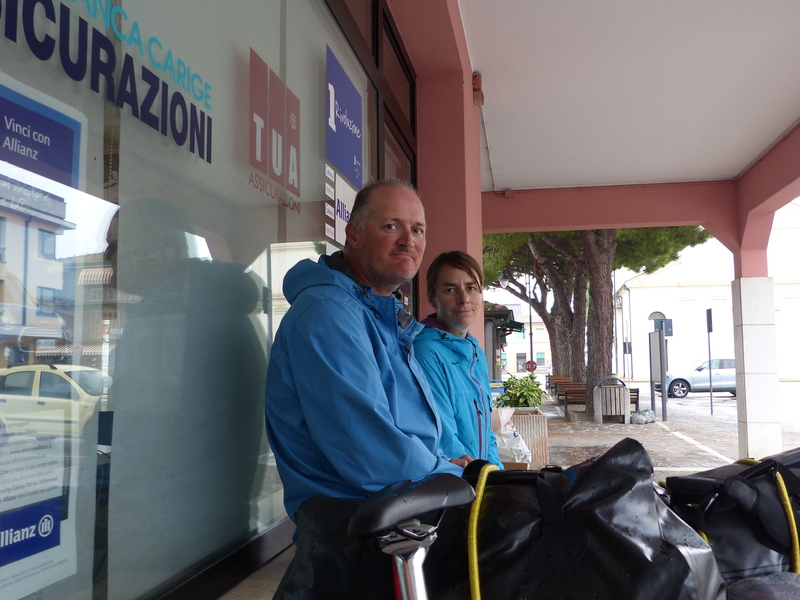 The rain seemed to ease off a bit, so we quickly saddled up, got pedalling again and hit the highway. 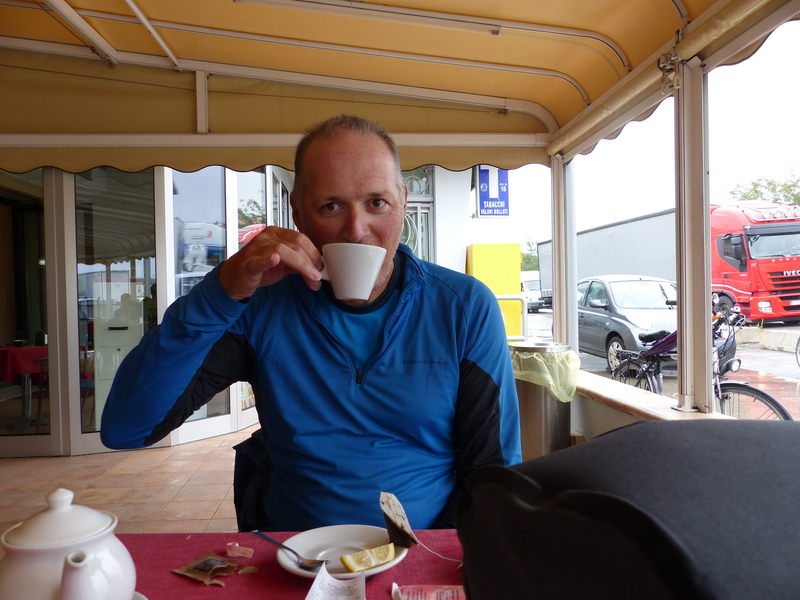 Steve isn’t too keen on the strong Italian coffee, so he’s become a tea drinker. The pinkie finger went into action again today! The line of traffic went on and on and on. A truck driver called to us as we rode past. I stopped, because I knew he’d be wanting some information about what was going on and what the hold up was. “Parlo Inglese?” I asked. He didn’t speak English, but said something in Italian and then bumped his two fists together. “Si,” I said, to say he was right in thinking there’d been a crash. “Due kilometre,” I added and stretched my hands wide, “long, long.” I was trying to let him know that the line of cars was two kilometres long, so he had a fair wait ahead of him. I don’t think I did very well at getting the message across though. As we pedalled, I kept looking at my odometer and by the time we’d reached the end of the line of traffic, the waiting cars and trucks were in a line seven kilometres long! Everyone was in for a long wait. I just really hope everyone came out of the accident OK. Once again, I shouldn’t complain about anything, because those people had a truly awful day. While we’d been sitting with our tea, we’d started researching where we might end up and what the accommodation options looked like. 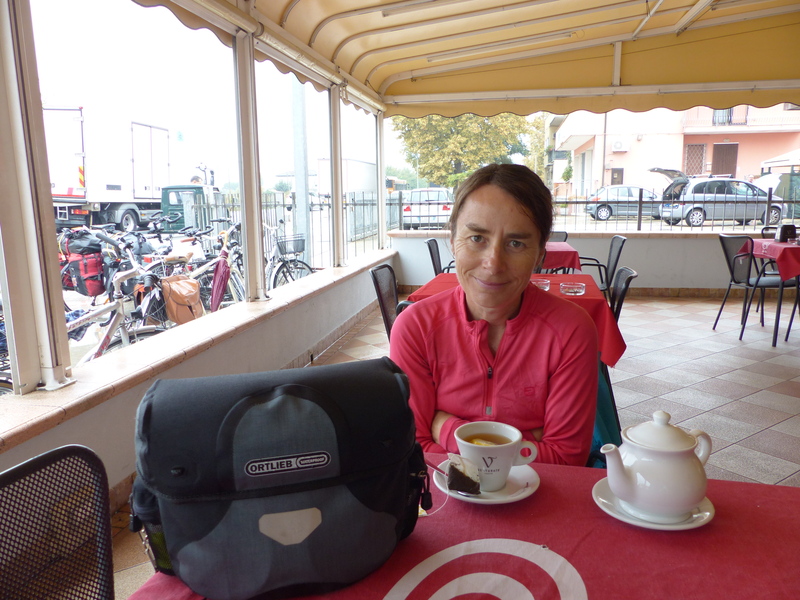 We’d planned to ride down the coast, but were finding that the towns were really far apart and with a nature reserve spreading down the coast too, the accommodation choices were pretty thin on the ground. We found a place that was only about 8km away, which would make the whole day’s ride way too short, but the next place was going to be about 90km away. We decided to keep going to the next closest town and reevaluate things there. 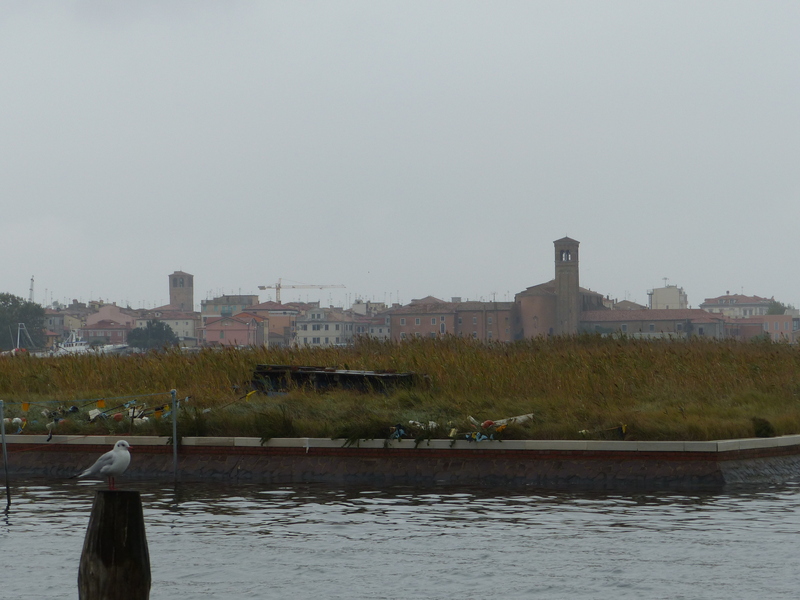 Rosalina was that town and we pedalled into the almost deserted streets, beside the highway. The rain kept coming down. We sat on a bench under a tree, to get a little bit of shelter and began looking up towns, distances and accommodation again. “I think this is really our only choice,” Steve said after scrolling down several different accommodation sites on the phone. So the weather and the accommodation choices had once again conspired against us and we were stuck after a piddly 22km. We then decided to look at alternate routes and abandon our plans to cycle down the coast, if it was going to prove to be logistically tricky. We also looked up the weather in different places and it seemed the rain that was forecast to keep going into tomorrow, was going to ease up the further inland we got. There were also more choices of towns and places to stay there, so we decided that would be our course. So…do we ride on and begin our new course inland or pull the pin. After all the time we’d taken sheltering, researching, discussing and re-planning, we were a bit over everything at that moment. We decided to just find somewhere to stay where we were and regroup to set off again tomorrow in a new direction. We booked a room and then waited until we could check in. Waiting consisted of standing under the eaves of a shop front. Travelling isn’t all tea rooms and comforts! I did get a laugh as we waited though. A lady walked past with her little French Bulldog and as they were passing, the little dog stopped dead in its tracks and stared up at Steve. It just propped and wouldn’t move, all it did was stare. The lady spoke to it, to get it to move on and gave a gentle tug on the lead, but that little dog just leaned against the lead and continued staring. It was the funniest thing. We talked to it, but its eyes did not leave Steve, it just stood and stared and stared. Then, all of a sudden, as if it had been stung on the tail, it just shot off! It took off running down the street to the end of the lead, forcing the lady to race to catch up with it! I laughed and laughed. I have no idea what it thought Steve was, but that little dog went from fascination to fear in an instant! If it’d had a tail, it would have been between its legs, but it was so funny to see it just stand, with a lean, staring so intently at Steve, before running away in a sprint of little legs, flying down the street. It was a very entertaining interlude! We’ll take shelter wherever we can find it! Check-in time finally arrived, so we pedalled around to the hotel, were given a storage room for the bikes and were then escorted to our room by the friendly lady on reception. I sat and felt very deflated. The day had finished way too soon, the ride had been less than fun and I was dreaming of the sunny, 80km rides that we had done only a short time ago. I don’t like it when we don’t put some decent distance on the wheels, so I felt like we’d had another day of letting the team down. We waited for a short break in the weather, walked down the street to get a snack, then wandered back, with the rain falling again. That was the day. Another less than ideal one, too short, another highway ride, another wet one and it all felt like we hadn’t achieved what we wanted to, yet again. Hopefully, with a change of course tomorrow, which means heading for the hills, we can find some scenery, different roads, different weather and hills or no hills, get some kilometres back on the odometer again. Come on Italy, we’re here to see you shine, bring it on for us! Let’s see you in all your glory, we’re ready! We’re waiting! Show us what you’ve got! Whilst you’ve been shivering, we’ve been roasting in Sydney. Last four days have been above 30 degrees. Today it’s been 18, which has made for a really nice change. Now you’re just messing with my head! Happy you’re having some nice weather though!